AltX-listed Alaris Holdings is a technology holding company listed on the JSE AltX since July 2008. The company announced today that on Friday, 4 March 2016, an agreement was signed between Alaris Holdings and European-based company COJOT, whereby Alaris acquired COJOT. On 28 April 2016, it confirmed that all conditions precedent to the acquisition have been fulfilled and the acquisition is now unconditional. The acquisition will take retrospective effect from 1 January 2016. Alaris Antennas, a subsidiary of Alaris Holdings, designs and manufactures specialised wide-band antennas as well as other related radio frequency products. Its products sell in the frequency spectrum monitoring, communication, test and measurement and electronic warfare market. The business operates mainly in the homeland security market space, helping to provide solutions to system integrators and frequency spectrum regulators. COJOT was founded in 1986 and is located in Espoo, Finland. The company has nearly 30 years of experience in the design, development and manufacture of innovative antenna products, serving military and public safety markets globally. 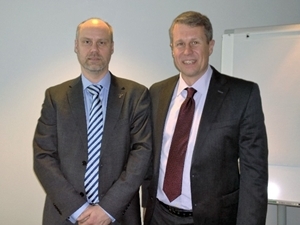 Group CEO of Alaris Holdings, Juergen Dresel, and chairman and previous co-owner of COJOT, Erkki Valkeasuo, have strategised around and negotiated towards this deal for several months. “Both companies see significant strategic benefit in joining forces, as the product lines will complement each other and the market which we serve is similar,” says Dresel. The two businesses are complementary and the combined operations will allow existing customers to receive an improved service as well as an expanded product portfolio through cross-selling. With both companies historically strongly focused on research and development and both companies holding practically exploitable patented technologies in their own right, it is expected that the fostering of design innovation and continued pursuit of novel technologies will be enhanced through the sharing of ideas and talent in both organisations. As such, the design and development of new products resulting from the combined skill sets of the two companies will provide more competitive features, enabling increased performance for end-users. Further, Dresel says: “We are very pleased to welcome Samu Lentonen, MD of COJOT, as part of the Group’s management team moving forward. Samu is well respected in the global antenna market and has managed to attract key accounts with well-known international customers. This is the Group’s fourth acquisition and is in line with the previously communicated strategy to expand its global footprint into Europe and the US. 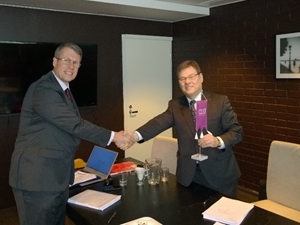 “We are confident that it will help Alaris to further grow shareholder value,” says Dresel. For more information, please contact: CEO Juergen Dresel, Alaris Holdings Ltd +27 (0)11 034 5300, [email protected] or MD Samu Lentonen, COJOT OY, tel +358 9 452 2334, [email protected].